Superior MULTIVIEW® IHC kits for efficient detection of multiple antigens in a single tissue sample. Formalin fixed paraffin embedded human tonsil double stained using MULTIVIEW® (mouse-HRP/rabbit-AP) IHC kit (Prod. no. ADI-950-100). 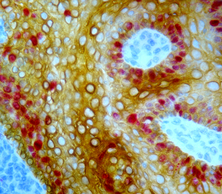 Primary rabbit anti-Ki67 antibody was visualized with HIGHDEF® red IHC chromogen (AP) (Prod. no. ADI-950-140), while primary mouse anti-HMW CK antibody was visualized with HIGHDEF® yellow IHC chromogen (HRP) (Prod. no. ADI-950-170, sold separately), producing a distinct golden yellow color contrasting with the bright red.